If you are planning to travel to Kuala Lumpur, this Kuala Lumpur travel guide is very much helpful for you to know more about the place. Kuala Lumpur, the capital of Malaysia, is the largest and most populated city in Malaysia. Kuala Lumpur (or KL) as it is commonly called by the locals lies in between Klang and Gombak rivers. Kuala Lumpur was started with tin mining activities before it turns into business, education, manufacturing, transportation, political and financial centre in Malaysia. Today, Kuala Lumpur and its surrounding metropolitan area are home to 6 million. Kuala Lumpur leads Malaysia’s fast paced development in all sectors like trade and business activities, banking and finance, manufacturing, transportation, education and tourism. Malaysia is considered one of the fast growing developing countries in South East Asia. Kuala Lumpur has plenty to offer in terms of famous landmarks, heritage buildings, shopping, vibrant night life and mouthwatering array of local foods. 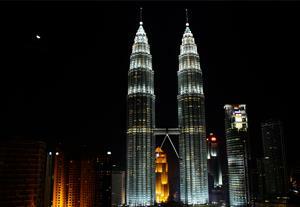 Famous landmarks in Kuala Lumpur that are not to be missed by tourists are Petronas Twin Tower and KL Tower. Petronas Twin Tower is used to be the tallest building in the world. The twin towers are connected at the 41 and 42 level by a Skybridge. Skybridge is opened to tourists for a bird’s-eye-view of KL city from KL tallest building. Besides the skybridge, KLCC shopping mall at the foot of the twin towers, offers branded and luxury shopping experience, delicious local as well as international eateries and few attractions such as the Petrosains Discovery Centre and the Malaysian Philharmonic Orchestra. Another famous landmark in KL is Kuala Lumpur Tower (or Menara KL in Malay). It has an observation deck offering a 360-degree view of the city, and hosts a restaurant serving scrumptious lunch and dinner. Heritage buildings that are worthwhile to visit, especially cultural lover, are the Jamek Mosque, the National Mosque, the Thean Hou Temple and the Sri Mahamariaman Temple. Because all these heritage buildings are also religious buildings as well, visitors to these places are requested to dress appropriately. The Supreme Court, the old Railway Station, and Parliament House are few attractive architectural buildings that offer photo taking opportunity to visitors. Kuala Lumpur is also a haven for shoppers. The Central Market at Jalan Tun Tan Cheng Lock and nearby Chinatown at Petaling Street are two bustling places where you can find local style restaurants and shops for variety of traditional handicraft items, textiles, clothes, shoes and handbags at bargain prices. Goods in these shops are okay to bargain, so it depends on your bargaining skill to buy your desired items at best price. Kuala Lumpur Golden Triangle area offers upmarket shopping experience. Reputable malls like Pavillion, Lot 10, KL Plaza, Sungei Wang PlazaÍ¾ Imbi Plaza, Low Yat Plaza, and Berjaya Times Squares are all gathering at this heart of Golden Triangle. They offer retail experience from luxury-brand items to public-market-brand items. You may also find the latest technology gadget at Low Yat Plaza. The most popular day trip and top tourist destination in Kuala Lumpur is to the Batu Caves. It is within a short driving distance north of KL. The main cave could be accessed by climbing up 272 stairs. Hindu devotees perform annual pilgrimages during the festival of Thaipusam by putting on kavadis and climbing up these steps to the temple inside the main cave. Batu Cave has become a pilgrimage site for not only Malaysian Hindus, but worldwide Hindus from countries like Australia and Singapore. For theme park lovers, you would not want to miss the two nearby world-class theme parks, Sunway Lagoon and Genting Highlands. Genting Highlands is about 45 minutes away from the heart of the city. Genting Highlands as the City of Entertainment, it boasts a family-oriented theme park at the environment of cosy weather, internationally-billed shows and live performances, a golf course, and the country’s only licensed casino. As for Sunway Lagoon, it is an amusement theme park located in Bandar Sunway, Petaling Jaya, which is about 20 minutes away from Kuala Lumpur. In 1993, it started with both the Water Park and Amusement Park. The Park then gradually develops other parks like Extreme Park, Wildlife Park, and Scream Park and has become one of the most visited tourist destination in Malaysia. The main Bus Terminals in KL are used to be Puduraya Bus Terminal and Jalan Duta Bus Terminal which serves trips between KL and East Coast of Malaysia. However due to growing traffic at the city centre, new terminals were built the ease the city traffic congestion. Currently Puduraya Bus Terminal only serves trips between KL and northern cities (like Ipoh, Penang, Alor Setar and Kuala Perlis) of Malaysia. Puduraya underwent renovation in April 2010 to upgrade services in order to provide better environment and services for commuters during the time at Puduraya. Since then, Puduraya was renamed as Pudu Sentral. For southern-bound trips, they have been moved to new bus terminal called Terminal Bersepadu Selatan since the opening in Jan 2011. Few popular routes like KL to Melaka and KL to Johor Bahru are relocated here, and thus it has significantly reduced the congestion at Pudu Sentral. This new terminal is fully air-conditioning, including platform, so it provides cosy environment for commuters while waiting for bus. For more information about Bus to Kuala Lumpur, check out details from us today!